During General Conference last week end I felt like I needed to make better efforts in Family Home Evening, to help teach the munchkin about Jesus. I decided to plan a lesson at his level, to help him understand the Plan of Salvation. I had a little diagram, a few primary songs, and some simple questions to help him understand that he is a child of God. Monday night came around, and as we launched into our discussion, I asked him where he lived before he was born. To my surprise, and Limi’s, the munchkin immediately pointed upward. Although he is getting older, I am sure he still senses his divine origin. It is incredible to watch little children learn about Heavenly Father and Jesus Christ, because it is as if they are still close to heaven, holding the hand of God. Last week, after making my Blushing Pumpkin Waffles, I had a little left-over pumpkin puree. I had plots to make pumpkin mug cakes, pumpkin cream smoothies, or some other spice-filled goodness. Then my husband asked me to make Cinnamon Rolls, and I knew it had to be the pumpkin version. I had a few problems with my old sweet roll recipe, probably because of the humidity and altitude differences here in Texas. I figured it would be a good time to test out a new one, and I was not disappointed! This recipe is literally the easiest dough I have ever worked with in my life. It only has 2 1/2 cups of flour as well, which is incredible to me, because many dough recipes I have seen use at least 5 or 6 cups. For being a cinnamon roll recipe, it also works up pretty quickly, allowing for rising and baking times. And let’s talk about the smell that wafts out of your oven as you bake these babies. De-lic-ious. Spicy, sweet and autumn perfection! Warm the milk and the butter together until the butter is just melted, then set aside. It is okay if there are still small chunks of butter. In your mixer, combine the pumpkin, brown sugar, nutmeg and salt on medium speed. Add the milk and butter mixture and beat until combined. Add the egg and yeast and beat for 30 seconds. Turn your mixer to low speed. Add 1 cup of flour, and mix for 5 minutes, scraping the sides of the bowl as needed. Add 1 1/4 more cups of flour, and mix until incorporated. The dough will be very soft at this point, so don’t worry. Coat a bowl with non-stick spray, and transfer the dough to the bowl. Roll the dough to coat with the oil, and cover with plastic wrap, or a damp towel. Put the bowl in a warm place and let the dough rise until it has doubled in size. This will take 30 to 60 minutes, depending on the warmth of the area. While the dough rises, make the filling. Combine the brown sugar and spices until evenly mixed. Set aside. Once the dough has doubled in size, punch the dough down. Roll it onto a lightly greased surface. Grease your hands and knead the dough, and add up to 1/4 cup flour if it is too sticky to work with. Roll the dough out to a 9×13 rectangle. Pour the melted butter over the dough, and brush to evenly coat the dough. Sprinkle the sugar spice filling over the dough. Roll the dough up, starting on one of the short sides. * Pinch the dough closed, then cut the dough into 8 pieces, using a piece of floss or string. To learn how to do this, watch this video tutorial. 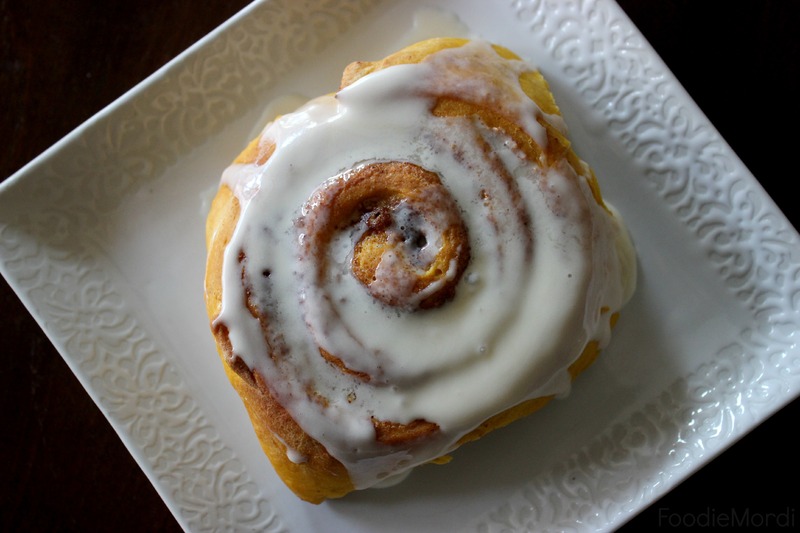 Put the cinnamon rolls in a greased 9×13 pan, two 8×8 pans, or similar. Press the rolls down to fill the pan. Put the pans in a warm place, and allow the cinnamon rolls to double in size. Preheat the oven to 350 (or 245 if you are in Texas). 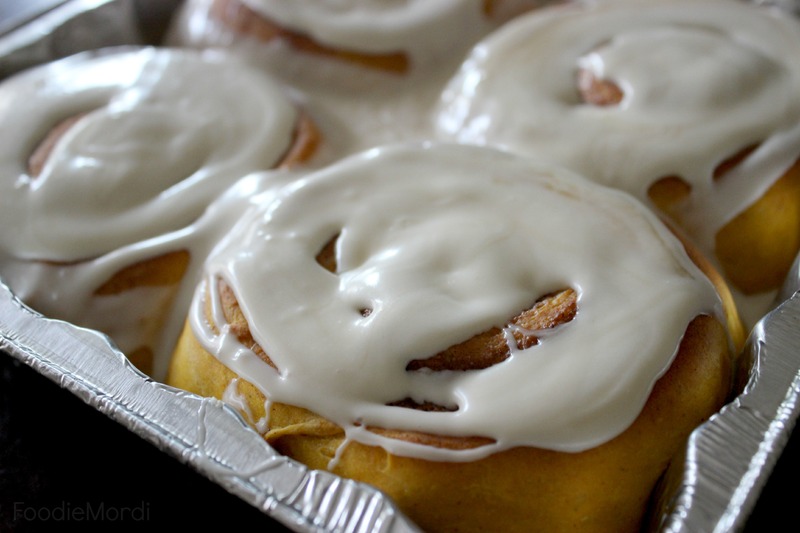 Bake the cinnamon rolls for 18-22 minutes, until golden brown on top. You can cover the rolls with foil during the last 5 minutes if you want light colored rolls. Once baked, allow the rolls to cool slightly, before covering with icing. 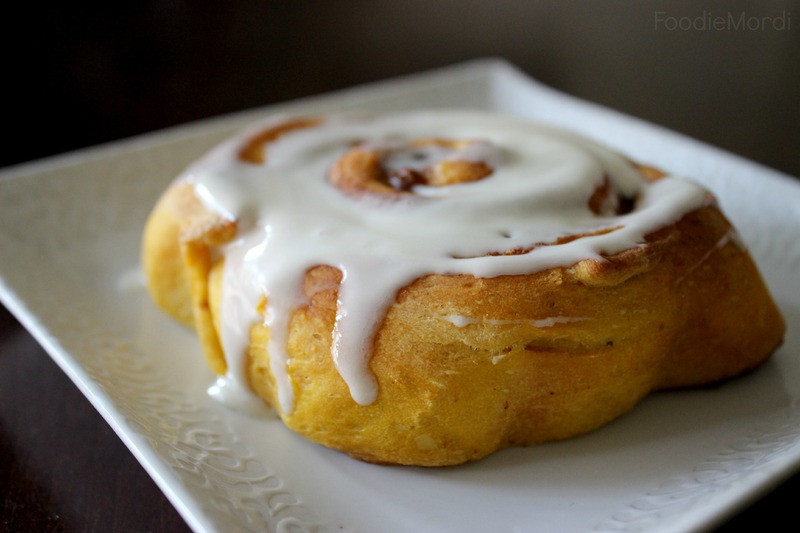 Mix the cream cheese frosting with the maple syrup and spread over the Pumpkin Cinnamon Rolls. Serve the rolls immediately, or cover with plastic wrap. *Rolling the dough from the short end of the rectangle will give you fewer cinnamon rolls, but they will be bigger around. You can roll the dough from the long end, and you will have more rolls, but they will not be as big.